Ever since she scored her first major magazine cover with Vogue Russia back in April, we’ve become accustomed to Grace Elizabeth delivering the goods whenever she lends her remarkable beauty to a fashion bible. After all, who could blame us after her gorgeous appearances on Vogue Spain‘s May issue and Vogue Italia‘s July cover? Grace now takes to the front of Vogue Mexico, helping the publication close out 2017 on a high, participating in a festive, wintry cover shoot, lensed by none other than Patrick Demarchelier. Needless to say, our forum members loved it. “I quite like them, she looks like a snow princess or something. 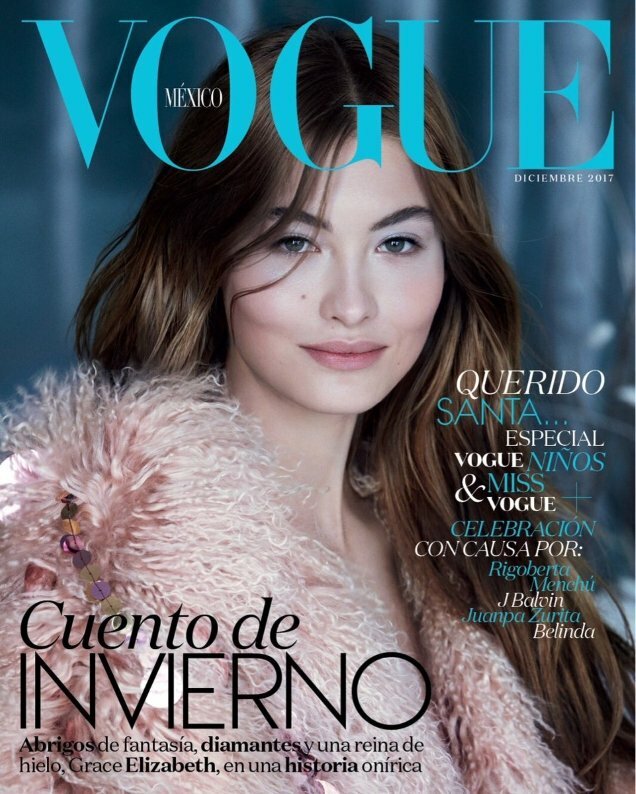 Very good for Grace Elizabeth too, scoring more Vogue covers,” said KateTheGreatest upon seeing this month’s offerings. “The first cover reminds me so much of Carla Bruni,” pointed out KateIsGr8. “YES!!! I immediately saw Carla Bruni when I saw the first cover (above) too. And I quite like the ‘snow princess’ vibe for a December cover,” echoed forum member niknak. “God she’s just soooooo beautiful,” sighed happycanadian. However, the covers weren’t to everyone’s taste. “These are really bad covers!” Bertrando3 expressed in horror. “Such a beautiful face, framed by limp curtains of hair that do nothing for her, other than drag the images down into bland mediocrity,” complained tigerrouge. See more from Grace’s wonderful cover story and voice your opinion with us here.